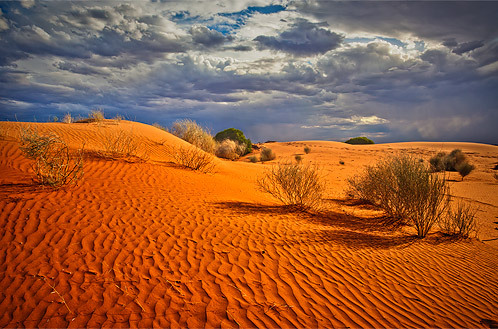 Sand dunes continually change shape, size and form at the whim of direction and strength of the wind. Therefore the opportunity for unique images is everpresent as this scene no longer exists in this form. I also sensed a storm approaching from kilometres off in the distance, and waited for it to approach. There was an eery stillness before evidence of strong winds swept toward me. This shot was taken moments before it became a dark sand storm. Therefore the image becomes a document of something which was changing so quickly, and constantly in transition.